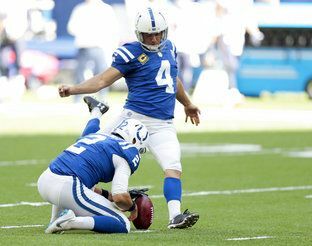 INDIANAPOLIS — Adam Vinatieri celebrated one major milestone Sunday by becoming the NFL's career field goal leader. He would have preferred doing it by adding to his league record for victories. The 23-year veteran made the record-breaking 566th field goal with 2 seconds left in the first half and No. 567 on a 44-yarder in overtime to give the Indianapolis Colts a 34-31 lead before watching Ka'imi Fairbairn make two more field goals to give Houston a 37-34 victory. "It's more fun when you get a win that's for sure. But it's a good record, a fun record, just would have been nice on a win," he said. "I think I'll probably think about it more when I'm done and gone. I was thinking about it when guys were congratulating me during the game, and it just kind of hit me just like that that's more than anybody's ever done." The previous record of 565 belonged to Hall of Famer Morten Andersen, who played high school football at Indianapolis Ben Davis. Vinatieri tied the record by making three kicks in last week's wet loss at Philadelphia before breaking the record on a bright, sunny day on his home turf. Had he not gotten the chance Sunday, Vinatieri's next chance would have come Thursday at New England, where he started his career in 1996. But the 45-year-old kicker, the oldest player in the league, kept that story line off the books by making the medium-range field goal to get the Colts within 21-10. Afterward, Vinatieri's teammates wanted to celebrate more than the new career leader did. "I heard the crowd a little more than usual. I think every one of my teammates came up to me, we were down at the time and was kind of like, 'We're down let's go win this game,'" he said. "Wish I had one more opportunity, I guess." Vinatieri needs to get used to these sorts of days given the charts he's still climbing. The South Dakota State alum played in his 341st game, breaking a tie with Hall of Famer George Blanda to move into fourth. If he plays in all 12 remaining games, he will pass Jeff Feagles (343) and tie Gary Anderson (353) for second all time. His next field goal attempt will surpass Anderson (672) for No. 2 all time. And Vinatieri has moved within 26 points of breaking Andersen's career scoring record of 2,544. Vinatieri has said he also hopes to break that record at Lucas Oil Stadium. He is the only player on Indy's roster who played on opening night of the stadium in 2008. What Vinatieri, dubbed the best clutch kicker in league history, does best is win. He's participated in a league-record 226 regular-season victories, owns four Super Bowl rings, has played on six AFC championship teams and is the NFL's career scoring leader in postseason games (234 points). His most memorable kicks do not count in the official league records. He made the decisive field goals in the final minutes to give New England two Super Bowl wins and two field goals in the infamous "Snow Bowl", or "Tuck Rule Game", to help the Patriots beat Oakland in overtime and start the run to the franchise's first Super Bowl crown. But he would have liked to win this one. "It's weird, you know, you come off a loss and it doesn't feel quite the same way," Vinatieri said. "I'm sure I'll look back at in years to come and it will be pretty special."